Cat owners among you with hard floor coverings will recognise the eldritch skittering of tiny paws at the witching hour, when all cats believe they have become rally cars. The owner of Jasper and Ruben (who, when researching this post, I thought was called Jasper Ruben; he remains anonymous for now – please leave a comment with your name if you’d like to!) has mechanised the problem. With a Raspberry Pi, natch. This is the web interface for Jasper and Ruben’s wheel. Cat-propelled, and Raspberry Pi-monitored, it logs distance travelled, average speed, duration of feline whirring, and all that good stuff, and displays the statistics in real time. The Pi’s GPIO is hooked up to a coil sensor behind the wheel, which is housed in an old DSL splitter box, held as close as possible to the wheel without actually touching it (the turquoise nubbin in the picture). 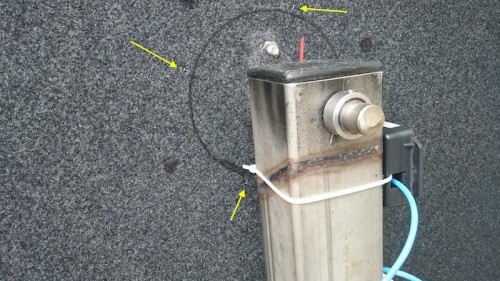 A coil sensor detects magnetic field, so the wheel itself has some modifications to make it detectable and measurable: six small ferrous nails hidden in the lining. 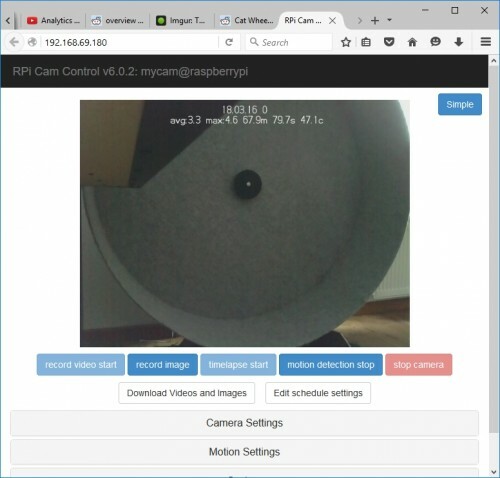 The Pi drives a camera board and interprets the feedback from the sensor, so it can display live statistics as the cat runs. It also enables the user to record any particularly nifty bits of cat-sprinting. Being human, you want to see more video of the setup in action. Here’s Jasper, being taunted by a laser dot, with real-time stats at the top of the video. You can see a comprehensive photo how-to on Imgur; Jasper and Ruben’s owner is also answering questions about the build over on Reddit. I suspect a bit of early-days encouragement with a laser pointer might help here; have to admit, my cats are in the same (plump) boat as yours, but they *do* have bursts of frenetic activity several times a day, which might well be aided by a GIANT WHEEL. They are in fact not interested at all in the laser pointer on the wheel for some reason, so this was a one time only event. They prefer being looked at and stroked while on the wheel, attention is the key word. Ha – it is with ours too; nothing pleases a cat quite as much as being looked at admiringly. Thanks ever so much for sharing the build; please let me know if you’d like your real name attached to the post! I suggest you all read this before proceeding further. please do never ever use a laser pointer as toy to play with cats (or other animals)! a laser pointer can be harmful for human eyes already, but can be much much more harmful for cats eyes because of their special “design” of the eyes to be able to have a better view at night (all those animals have much more sensitive eyes). even an indirect reflection can cause permanently damage of cats eyes! However I don’t know anything about cat eye physiology or damage threshold. Do you have any references on that subject? For example, if the greater light sensitivity of the cat’s eye is only due to a larger iris, that doesn’t increase the hazard from a thin (few mm diameter) beam relative to a human eye, because the same laser power could enter either kind of eye. It could always be used to recharge a wireless mouse…. If it would drag a toy rabbit on a wire, you could make millions selling it to the Jack Russell Terrier races. Well, Maybe not, the current system seems to work very well. Now it just needs an RFID chip for each cats collar, so you can log who runs and when! very cool …this could be joined with spinning led display . depending on the controller & config. you could display time and mph…temp ….. I like what you did..
You could use an LED strip to make a dancing light always hanging out around 90 or 270 degrees, encourage the cat to try to run up the wall. I saw this on Amazon some time ago. I always wondered if my cats would maintain the interest or leave it after a couple of uses. What is your experience ? I know that Bengal cats use it spontaneously and often. When you go to YouTube and search for “Bengal wheel” you’ll find a lot of those videos. Of course not so technically advanced as Jasper Ruben’s.